via Instagram - "Chocolate fondue with lotsa' strawberries and marshmallows / Meow." On those rare slobbish days that I have, I can get ready within 15-30 minutes. Today is one of it. It feels good to finally be able to take a moment from weeks of intensive studying to having to go through two sittings of examination in a day, and wrapped it up with a short afternoon nap. By then when I woke up, I had a choice of either wanting to attend to my desperate call for yet another nap AGAIN or to wash up within 15 minutes and off to the mall with the brother. If you know me well enough, I have real 'mango-lust'. I loveeeee mangoes and I just had to have something mango-ish. So, I got mom to get me mango juice and she always never fail to go, "MANGO AGAIN! Sheeesh.." every time. Haha. We did a bit of grocery shopping, with the intention of mainly getting what were needed for our chocolate fondue. Strawberries, marshmallows.. I was meandering about, browsing in random aisle when I came across Hello Kitty snacks! 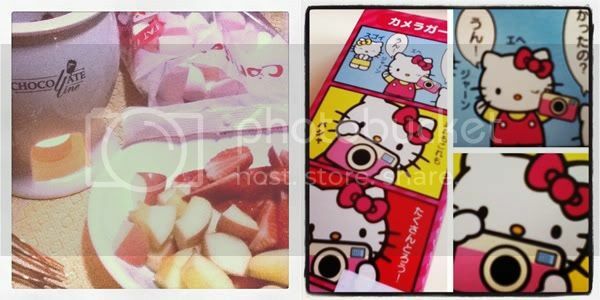 I bought myself almond coated pepero, strawberry flavored pocky along withKabaya Hello Kitty pretz.